Pruning is an act that impacts a tree’s entire life. Pruning may need to be done for several reasons, but it should always be done with the health and safety of the tree in mind. A tree that is improperly pruned can be weakened, have a shortened life, and have a reduced aesthetic value. An improperly pruned tree can also become potentially more hazardous, but tree pruning correctly can reduce a tree’s hazard potential. Over time, it has been determined that many commonly accepted pruning practices can be detrimental to tree health. Foliage and branches grow to acquire sunlight and support tree growth and development. When the grown or canopy is raised, it only leads to reduced photosynthesis and a weakened development of taper (trunk) growth in response to wind stress. When done correctly, the canopy can be adjusted appropriately to provide for clearance for obstacles and safety. The worst form of raising the canopy is done when all limbs are removed expect for the top remaining few. This is known as a “lion’s tail.” This process drastically reduces photosynthesis, significantly wounds the tree, and disrupts the tree’s ability to move with the wind and build taper to support its remaining foliage. This can be extremely damaging to the tree. Always avoid this practice. Never reduce a tree to a size that is not typical for its species, variety, or cultivar characteristics. If a tree is too big for its location, the best decision we recommend is removal and replacement with a species that more matches the needs of the site and the client. When a tree has its branches and limbs removed to reduce its height, this is known as topping. This practice is also called a “tree haircut.” This method is damaging as it leaves large wounds that allow decay to spread rapidly which creates several epicormic branches that have very little structural integrity. When cuts are made at branch junctions, this is known as crown reduction pruning. If the branch collar is violated, then decay can easily spread into the wounded tissues. Sometimes branch sprouting can occur at the pruning cuts which results in the same weakened structural syndrome as topping. Crown reductions can be done by using a process called subordination pruning, where branch tips are removed back to the crotch to bring the canopy into a more compact profile. Many use a process called thinning on their trees believing that it increases light penetration and air movement through the canopy. However, engineering research on tree dynamics in wind have shown that thinning a tree’s canopy reduces the cantilever effect and increases its risk of branch failure in normal winds. It can also reduce net photosynthesis and cause stress to remaining limbs and living tissues. Reducing interior branches also reduces structural support for the remaining foliage by shifting the weight load to the end of the remaining branch. 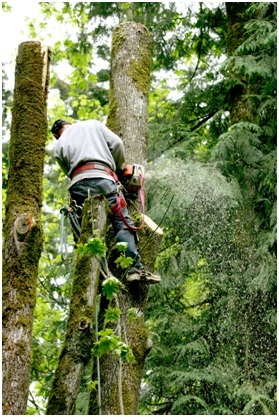 The ancient horticultural pruning technique of pollarding involves topping trees and then annually pruning off the sprouts. After years of cutting back the sprouts, the stems become callused over. These cuts create wounds that have a difficult time healing, but the continual removal of sprouts can prevent the development of hazardous limbs. A serious problem to consider with pollard trees is the problem of internal decay. Topiary is the practice where wood plants, including trees, are pruned and forced into “artistic” shapes. This kind of severe pruning must get continual maintenance to maintain the shape, structure, and support of the impacted tree. Unfortunately, this practice can also reduce the structural integrity and health of the trees. Pruning is an act that impacts a tree’s entire life. Pruning may need to be done for several reasons, but it should always be done with the health and safety of the tree in mind. A tree that is improperly pruned can be weakened, have a shortened life, and have a reduced aesthetic value.